August 29, 2016 by Erby Crofutt & filed under Uncategorized. I recently found a double trap under one sink (with a corrugated drain pipe thrown in for good measure) and a missing trap under another sink in the same house. The double trap drastically slowed the drainage from the sink. The sink that was missing the trap had that nasty sewer odor smell coming from it. 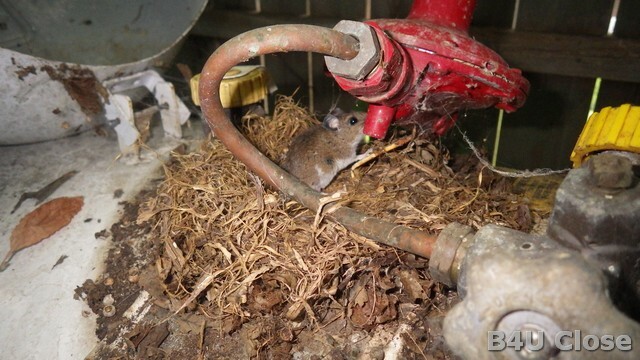 P-traps (or older S traps & drum traps) actually have a purpose under the sink or tub/shower or in a toilet. 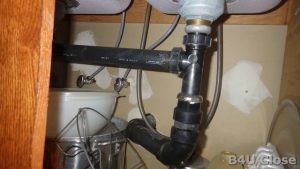 That U shaped bend under the sink traps a plug of water in it that keeps nasty sewer gases from coming back up the pipe into the house. Of course, it can also catch rings, earrings and other items that may be inadvertently dropped down the sink. Two traps can allow a vacuum to form slowing or even completly stopping water from draining down the pipe. 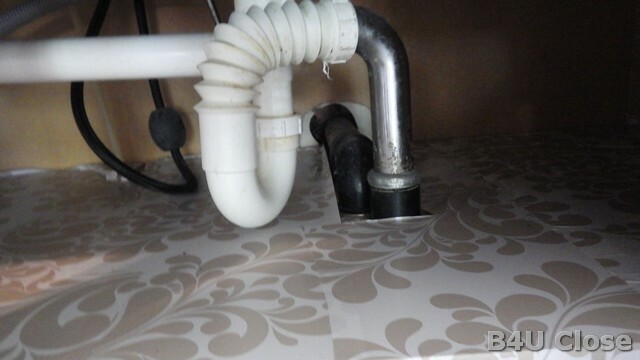 It shouldn’t take the plumber too long to move the extra trap to the right sink. July 27, 2016 by Erby Crofutt & filed under Uncategorized. It can be a little disconcerting when opening electrical panels and finding live mice inside. Not quite so disconcerting is the one that’s been there for awhile, such as the one in the picture below. 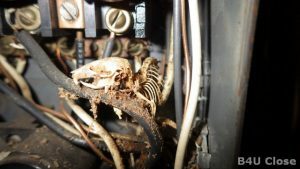 That’s one of several reasons the openings in the electrical panels are supposed to be covered. It doesn’t bother me quite so much when they are in the propane tank lid outside! July 26, 2016 by Erby Crofutt & filed under Uncategorized. You know what a crack pipe is. You know what a crap pipe is. Ever seen a cracked crap pipe? Yeah, I think it’s time to replace the crap pipe! January 11, 2016 by Erby Crofutt & filed under Uncategorized. 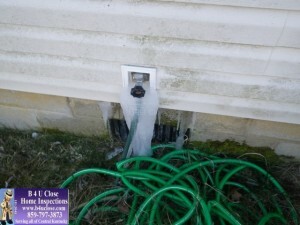 Not everybody remembers to take their hose off the exterior faucets before winter sets in. 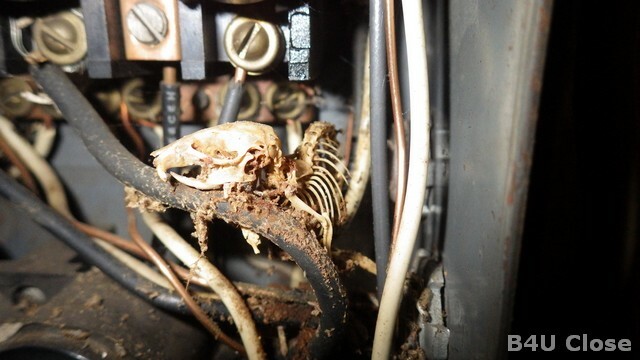 I found this during a home inspection in Lexington, KY. Did you prepare YOUR house yet? I’d bet the plumber will charge a couple of hundred bucks to come out and fix the cracked pipe in the crawl space of this home in Lexington, KY.
Kentucky winter and freezing weather require some preparation at your house. I hope you’ve prepared your home. December 3, 2015 by Erby Crofutt & filed under Cockamamie Photos. Welcome to the B4U Close Home Inspections Cockamamie Photos Page 2. 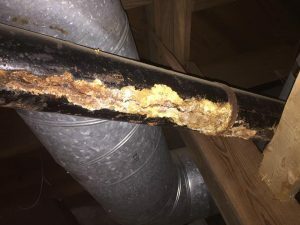 Welcome to the B4U Close Home Inspections Cockamamie Photos web pages. Some things just have to be shared and these are some of those things. Click on the large photo to see a LARGER view of the picture.